​On April 6, 2016, the Department of Labor (DOL) released its long anticipated rules mandating that all advisors assume personal fiduciary responsibility in all of their dealings with all retirement plans. The new rule goes into full effect on April 10, 2017. The impact will be far reaching not only for advisors, but also for every manufacturer, distributor, and broker dealer involved with retirement plans. It even affects every property and casualty and/or life and disability agent who sells products to retirement plans and/or makes any offers or renders advice to retirement plans, the plan’s participants, sponsors or beneficiaries. Registered Investment Advisors (RIAs) and their firms have long been held to an even higher and broader standard of fiduciary behavior. The SEC is expected to release its new regulations related to fiduciary standards later in 2016. The Obama administration has intended these changes (and far more comprehensive) for years. Now that it is law, the natural progression would be to create fiduciary rules of conduct beyond retirement plans covering all aspects of financial advice, products, and services, mirroring the RIA standards. That has been the trend globally over the past decade. If the trend continues in America as it has in Europe, there will be no more commissions and far fewer (if any) packaged products such as variable life insurance or variable annuities. Suitability standards under FINRA remain intact related to accounts that are not held in qualified retirement plans. However, the SEC regulations could extend fiduciary standards to all accounts, not just retirement accounts. Notwithstanding the industries preference for the ambiguities and minimal accountability found in FINRA suitability models, informed consumers will no longer tolerate them. The biggest impact will be in the minds and hearts of consumers, trustees, and just about every investor. Educated investors will not settle for “protection” under suitability standards on any account once they see how fiduciary standards provide far greater safety. Plan providers, participants, and fiduciaries such as investment committee members are going to purge “advisors,” products, and models that are not contractually obligated to assure fiduciary responsibility. Intelligent investors (and their lawyers) will demand fiduciary treatment, transparency, and safety. They will stop subjecting themselves and their retirement plans to higher risk, conflicts of interest, hidden fees, high expenses, and withdrawal penalties. The heyday of annuity products sold the old way is effectively over. Sales organizations will have to completely re-tool. A mandatory change of this magnitude will cause many sales leaders, managers, and agents to adapt or leave very quickly. The significant fines as well as criminal penalties will hammer those who are slow to adopt or who revert back to a sales mindset and behavioral patterns. These individuals and companies will be purged from the financial services professions. Your Salesforce can learn how to think and act like a fiduciary must think and act. This includes a new and very elevated and detailed data intake process, note taking, comprehensive comparative analysis, transparency, and conflict disclosure. In fact, it’s a radically different way of being than what sales organizations or their people are familiar with. To protect the client’s best interests, you must actually know what they are and have them in a written plan. All that data and detailed notes spell disaster for salespeople who prefer ambiguity and less accountability. Your Board of Directors can choose not to adopt and stop all of your dealings with all retirement plans. This means the termination of those relationships and potentially all relations with those clients. Your BOD can wait for fiduciary standards to take over every aspect of financial advice and services, then re-tool and re-train. Your BOD can ignore the change, then consequently pay significant fines and/or see some of your salesforce and managers serve time in prison and be judicially removed from the profession. 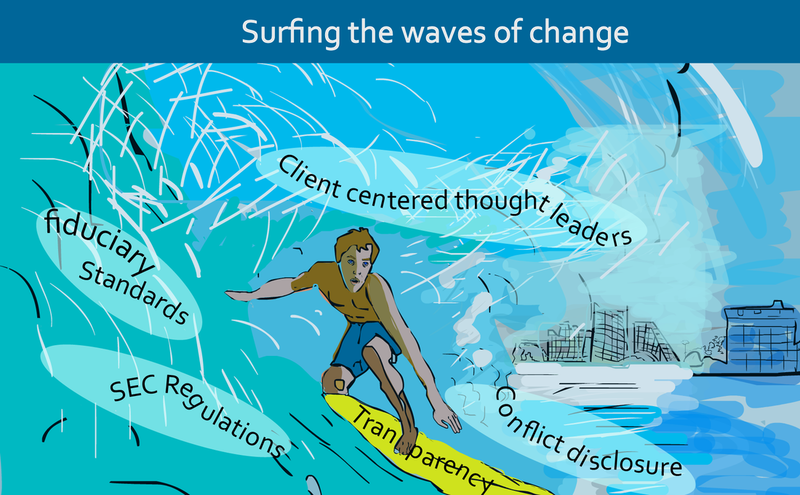 Your BOD could treat this as the greatest opportunity ever to position your firm and its representatives as client-centered thought leaders and ride this wave of change to market prominence. There will be an overwhelming array of choices regarding who to obtain training from. How to strategically and tactically get from where your firm is now into the dominant position of tomorrow will be offered to you by thousands of consultants, training firms, and business and life coaches. Most of whom have too little or no practical, tactical track record delivering a profitable fiduciary model to the public. This subject is too complex and risky to be entrusted to dabblers or those inclined to protect or favor the status quo. You can transcend the complexity and risk by engaging the right people. Attracting or finding the right talent and expertise to get you from here to where you need to be next is easier today than ever before. Sound due diligence and vetting are essential to safeguarding you in your role as a corporate officer and fiduciary. We want to help you with that. The Wright Company is my intellectual property ownership and licensing business. It owns many intellectual properties including the world’s preeminent (and most profitable) fiduciary business model. That model has been used since 1990 to imagineer and orchestrate billions of dollars of re-positioned wealth while never being sued by even one client anywhere in the world. That’s the kind of proven track record that stands out when one is conducting a fiduciary due diligence search for excellence, understanding, training, and execution. ​We invite you to experience a completely confidential courtesy call with me to discuss your personal and/or company’s needs. To arrange your free confidential call, please call my office at (800) 997-2664 if you are in the U.S.A. If you are calling internationally, please call +1-805-527-7516. Bruce Raymond Wright is the inventor of Macro Strategic Planning® the world’s preeminent fiduciary business model. He is an internationally respected author, keynote speaker and change facilitator. Bruce’s latest book, Transcendent Thought and Market Leadership 1.0; How to Lead Any Profession, Anywhere in the World is available on Amazon.com and most online bookstores. Inquiries about keynote speeches, training programs, licensing, consulting, and mentoring can be emailed to BWright@MacroStrategicDesign.com or you may call 805-527-7516 Monday through Friday between 10:00 – 4:00 PDT. ​Artwork provided by Nicole Rose, a fine artist, author, compliance lawyer, and CEO of Create Training International based in Queensland, Australia. The purpose of this article is to provide a brief and broad overview of the due diligence process in a merger and acquisition ("M & A") transaction. By increasing your understanding of the due diligence process well in advance, whether you are on the sell-side or the buy-side, you will be able to save time and money in both the short-term and long-term. Additionally, the better informed you are, the more likely you will be to obtain a more successful outcome. The reader should note that throughout this article where the author uses the phrase "the seller" or "the buyer" it is implied the phrase also means their respective company representatives and M & A team advisors, including, without limitation, their business consultants, investment bankers, accountants and M & A legal counsel. 1. The Purpose of Due Diligence. A. Buyer. The buyer needs to get a thorough and accurate "snapshot" of what the buyer is purchasing. A due diligence review should give the buyer insight into the target's operations, culture, human resources, supplier and customer relationships, competitive positioning and future outlook, among other things. Potential financial, legal and regulatory exposure needs to be assessed, and the buyer needs to obtain hard data as it goes on a fact-finding mission to investigate the seller's business before a final decision is made whether to proceed with the transaction. Indeed, immediately after the closing of the transaction the buyer will be responsible for operating the business it has acquired. Done fully, due diligence can give future management a holistic view of the company being acquired and its culture. This also informs the buyer on how to integrate people, platforms, cultures and align all of the business interests and opportunities. It should be noted if a third-party, such as a bank or private equity firm, is providing some of the financing for the transaction, that the financing or investing party will want to participate in the due diligence process and obtain a "snapshot" of the business of the seller as well. B. Seller. The seller needs to determine what "change of control" provisions exist in its contracts that may be triggered by the transaction, and what stockholder consents or other third-party notices or consents may be required to enable the seller to sign and close the definitive acquisition agreement (the "Acquisition Agreement"). In addition, the seller needs to ensure that the representations and warranties of the seller and/or owner(s) in the Acquisition Agreement (and the related disclosure schedule (the "Disclosure Schedule"), which complements those representations and warranties and is part of the Acquisition Agreement) are accurate and do not lead to post-signing and/or post-closing buyer indemnification claims and purchase price claw-backs. After all is said and done, it’s important for the buyer and seller to be content with the transaction financially and culturally. Avoiding lawsuits and claw-backs is paramount to a successful transaction outcome. C. A "Win-Win" Process. Each party in an M & A transaction is obliged to protect and further its own self-interest. When the due diligence process is a "win-win" for all parties involved, the process is faster, easier and less expensive. The disclosure of information, representations and written statements adds great clarity to the overall M & A transaction, and helps avoid misunderstandings that could otherwise lead to disputes after the deal closing. Through performing the due diligence process, which is arguably a cooperative process, surprises and future disputes are minimized and hopefully completely avoided, which saves time, money and aggravation for all parties involved. 2. Beginning of the Due Diligence Process. The due diligence process begins, or at least should begin, virtually immediately after the signing of the letter of intent ("LOI"). For why the seller should have an LOI, please see this author's article entitled WHY YOU, THE PROSPECTIVE SELLER OF A PRIVATELY-HELD BUSINESS, WANT AND NEED YOUR OWN HIGHLY CUSTOMIZED LETTER OF INTENT ("LOI"). The seller, with a satisfactory LOI signed (with an appropriate confidentiality provision therein, or an adequate separate buyer-signed Non-Disclosure Agreement), should want to move the M & A transaction forward as quickly as possible. A smart seller will hurry so as not to allow any unrelated "Black Swan events" to potentially take place that could for any number of reasons unravel the M & A transaction before the Acquisition Agreement is signed, closed and paid out. The buyer, though it will want to be diligent and thorough in getting a clear "snapshot" of what it will be purchasing, will not want to exceed the exclusivity period it negotiated and the seller agreed to as set forth in the LOI or in a separate standalone agreement. Exceeding that time period would allow the seller to open discussions with other potential buyers, which any serious buyer wants to avoid. Meeting deadlines secures exclusivity and keeps the process moving towards everyones’ desired goals. All that said, both the seller and the buyer should have prepared themselves structurally and financially far in advance before the due diligence process even begins, and before any LOI (letter of intent) is proffered by either party. A. Advance Due Diligence Preparation by the Seller. As discussed in this author's prior article entitled BUILD AN EXPERIENCED, HIGH-QUALITY M & A TEAM AND PREPARE EARLY, the seller should work with its consultants and advisors such as accountants and tax lawyer on its financial due diligence materials, and with its M & A lawyers and potentially other experts on its business and legal due diligence materials, as early and as far in advance as possible in order to (i) "clean-up" and fix what needs fixing and is fixable, and (ii) take advantage of as many potential tax advantages and related transaction structuring possibilities as the seller's situation will allow. Optimizing the investment or transfer readiness of a business well in advance of the initial offering stage is a very wise and cost effective strategy. Being in such a state of readiness can help increase the price offered and it speeds and eases the entire process. Ideally, long before the LOI is signed the buyer's lawyers should proactively provide the seller with a due diligence checklist that will typically be nearly identical to the ultimate due diligence checklist that the buyer presents to the seller after the signing of the LOI. Assuming the seller has worked with the seller's legal counsel and others to organize and perfect the disclosure materials related to seller's business, the seller will be prepared to virtually immediately respond to the buyer's due diligence checklist requests with thorough, organized and accurate responses. These prompt thorough, organized and accurate due diligence request responses will make the seller's business appear professionally organized and well-run, provide the buyer with confidence in the acquisition, hasten the pace of the M & A transaction, and save all of the M & A transaction participant's time and money. It should also increase the odds of a successful signing and closing, the goal of all serious M & A transaction participants who, as time goes by, will be increasingly invested in the process and successful outcome of the M & A transaction. B. Advance Due Diligence Preparation by the Buyer. The buyer uses the buyer's due diligence review to not only get a "snapshot" of the target business, but also, to the extent it finds surprises or problems with the business, to understandably attempt to "re-trade" the deal earlier agreed upon in the signed, but generally legally non-binding, LOI. In such a re-trade the buyer may ask for a lower purchase price or better deal terms, such as more extensive indemnification rights, often coupled with a higher purchase price holdback or escrow amount. If the due diligence surprises are bad enough, the buyer may decide to "walk away" from the M & A transaction entirely, causing a loss of time and money for all M & A transaction participants. C. Potential Consequences of Due Diligence Delays by the Seller. To the extent the seller is unprepared and is unable to promptly provide the buyer with the due diligence materials requested in the buyer's due diligence checklist, the buyer is in a position to attempt to renegotiate the exclusivity period deadline contained in the LOI or separate standalone agreement. Indeed, the buyer will say it is ready, willing and able, and given the document production delays it is unfair to hold the buyer to the exclusivity timeline given that the buyer negotiated the exclusivity period deadline with the expectation it would be provided with the requested standard due diligence materials promptly. At some point delays by the seller will give the buyer concern about the viability or trustworthiness of the overall transaction, which can lead to the buyer walking away and the transaction cratering. As with riding a bicycle, an M & A transaction needs ongoing forward momentum to be able to remain balanced and moving forward to reach the intended destination. Without that ongoing forward momentum, like a bicycle, the M & A transaction often totters and crashes down. Accordingly, the readiness and trustworthiness of each party is critically important. Being “on time” every step of the way helps to demonstrate readiness and trustworthiness. Without adequate enthusiasm and trust, it is unlikely that your deal will come to fruition. 3. How the Due Diligence Process Usually Works. A. The Buyer’s Due Diligence Checklist. The buyer will provide the seller with a due diligence checklist which is typically very detailed and rather generic but somewhat customized to seller's business. The seller will provide the buyer with information responsive to the buyer's checklist requests, either stating the item requested is not applicable, or providing materials that are responsive. Generally speaking, it is in the seller's interest to disclose as much as possible to avoid post-closing buyer surprises that may lead to indemnification claims and purchase price claw-backs. B. The Seller’s Electronic Data Room. More often than not, the seller pays a third-party provider to set up an electronic data room for the due diligence review portion of the M & A transaction. The seller can control and limit who receives data room access and accordingly gets to review the seller’s confidential due diligence materials contained therein. In addition to saving everyone the time and expense of traveling to review the due diligence materials on-site, the seller’s data room also provides the seller with the ability to see which authorized individuals have entered the data room when, for how long, and what specific data was reviewed. If the buyer is not actively reviewing materials in the data room, the seller can reasonably assume that the buyer has only limited interest in the transaction. At the end of the transaction the seller can get a CD-ROM containing everything that it posted in the data room, which is useful for both historical records and in the event of a post-closing buyer indemnification claim. A thorough historical record is beneficial to all sincere parties. 4. Due Diligence Process and the Acquisition Agreement. In most M & A transactions the due diligence review does not delay the negotiation of the draft Acquisition Agreement, and both processes occur concurrently. These M & A processes can occur concurrently in part because to the extent the representations and warranties in the Acquisition Agreement do not accurately reflect the business of the seller/owner, in addition to the negotiation by the seller and the buyer of their revision, they also can be "fixed" by adding schedules to the Disclosure Schedule (which begins as a blank document). For example, if Section 4.21 of the draft Acquisition Agreement prepared by the buyer is a representation and warranty of the seller stating, incorrectly, that there is no current litigation, Section 4.21 of the Disclosure Schedule prepared by the seller can cure the inaccuracy by listing the current litigation (assuming it is made clear in the portion of the Acquisition Agreement with the representations and warranties that they are modified by the corresponding schedules set forth in the Disclosure Schedule, a provision which is very typical and standard). The Disclosure Schedule is initially prepared by the seller, and is subsequently reviewed and commented on by the buyer. The seller and buyer work together on perfecting the Disclosure Schedule, which is why both the seller and buyer are in a sense due diligence review partners. Accuracy and a “win-win” mindset are beneficial to everyone involved. To competently prepare the Disclosure Schedule the seller must know its own due diligence materials inside-out. Those materials must be complete and accurate if the seller is to protect itself from potential post-closing indemnification claims and purchase price claw-backs. For this reason it is imperative that the seller’s due diligence materials are organized and reviewed in detail by the seller and its representatives in advance so as to avoid potentially costly mistakes and to save time and money for all. 5. Variations on the Theme. A. When There is No LOI. In some cases there is no LOI between the seller and the buyer. The parties go directly to negotiating the Acquisition Agreement, typically with the thought of saving time and money (although in this author's experience it rarely works out that way). Once again, the due diligence process begins immediately, while the Acquisition Agreement is being negotiated. Typically, without the main business points decided in advance, as occurs with a signed LOI, the Acquisition Agreement takes longer to complete and sometimes never gets completed at all. B. When the M & A Consideration is the Securities of the Buyer. Not all M & A transactions use cash as the sole form of consideration for the seller. For example, it may be agreed that the buyer may use its own securities as all or a portion of the consideration for the seller. Alternatively, the seller may be provided with consideration in the form of an "earn-out," pursuant to which the seller is paid the seller's consideration (be it cash and/or securities) over a period of time after the closing based on the post-closing performance of whatever is agreed upon by the parties (typically the performance of what the buyer purchased). There are numerous other examples not listed above. In such situations the seller needs to conduct either a partial or complete due diligence review of the buyer, since the seller is in a sense also purchasing the buyer, and accordingly needs its own "snapshot" of the buyer. Everything in this article described above applies in this situation. When properly performed, due diligence is a two-way street. Everyone needs to be ready, accurate and trustworthy. C. When An Owner will be an Employee or Consultant of the Buyer Post-Closing. In an M & A transaction in which post-closing an owner will become an employee or consultant of the buyer, it is important that the owner perform some due diligence review of the buyer, at least to understand the business process, infrastructure, culture and key personnel at his or her potential future employer. Hopefully some of these matters will be addressed in the LOI between and/or among the M & A transaction parties. 6. Summary and Conclusion. M & A due diligence is a key part of every M & A transaction that is necessary, and is arguably of material benefit to both the buyer and the seller alike. It can and should be cooperative and need not be a zero-sum game. Thorough and competent advance preparation for M & A due diligence is necessary to saving both time and money, and for maintaining the ongoing forward momentum necessary to keep the M & A transaction balanced and flowing toward a successful signing and closing, the goal of all committed M & A transaction participants. Over the past three decades we have studied thousands of opportunities and challenges for clients. In the vast majority of those projects, Macro Strategic Design was the only organization being paid directly and solely by the client to analyze and diagnose the MACRO and MICRO aspects of the project. In most cases, the recommendations for the client to act or change or buy some kind of asset, investment or insurance product were introduced and supported exclusively by salespeople or biased advisors whose compensation was directly connected to having the client implement their proposal(s). Without a thorough and unbiased review, our clients would have been “flying blind” so to speak and left vulnerable to the damage that so often occurs when piecemeal or transactional thinking drives a decision. We are not suggesting that all salespeople or advisors with conflicts of interest are not to be trusted. We are suggesting that it is wise to apply competent, unbiased, unconflicted due diligence prior to any significant sale, loan, investment or acquisition. In wood shop in the seventh grade, Bruce Raymond Wright’s teacher reminded his students daily to “measure twice, cut once.” When dealing with anything of great importance or where holistic synergy is relevant, second or third opinions can save you from making a disastrous mistake. Piecemeal, transactional thinking and action is amongst the most ineffective of human behaviors. Salespeople thrive upon and even depend upon their prospects taking fast and under scrutinized action. Truly client centered, competent and honorable professionals expect and respect a reasonable level of scrutiny (due diligence) and the time necessary for clients to make well informed synergistic decisions. We believe that due diligence is most effective when the process and those performing the evaluation(s) are not conflicted. We do not believe that due diligence performed by the company or person trying to sell the asset to you is optimally effective for the consumer. When we carefully take measure of a situation from both a MACRO and MICRO perspective, we are able to make more aware, enlightened, holistic and informed decisions. The following story is excerpted from The Wright Exit Strategy - Wealth; How To Create It, Keep It and Use It authored by Bruce Raymond Wright. Bruce updated it slightly for this website in June 2014. It illuminates how a wiser MACRO perspective can be more valuable than even the best of MICRO tactical plans performed by paid advisors (in this case a CPA) and biased salespeople who fail to inquire about, understand and act in support of a client’s highest and best interests. Why to do it or not to do it? Where to do it or not to do it? When to do it or not to do it? Who to do it with or not to do it with? In what ways is this important to accomplishing, protecting or furthering my highest and best interests? What to do or not to do? Of the x number of options explored and put through the due diligence process, why is this my most suitable option for accomplishing these goals A ___, B ___, C___, D___? Am I confident that this action or inaction will help rather than hurt my grand vision and best interests? After you read the story below, please email us your thoughts about it and we will send you a free gift as a token of our appreciation for your feedback.